The Garden State is still on track to see an extended period of rain, wind, and heavy surf from a nor'easter Sunday, Monday, and Tuesday. While Saturday will be a quiet and mild day across New Jersey, our weather will quickly turn downhill Sunday and beyond. A powerful storm system complex - a nor’easter - will push across the Garden State. Impacts will range from heavy rain, to (limited) wintry mix, to strong winds, to heavy surf and coastal flooding. If the forecast holds, I would expect these coastal areas to be eventually upgraded to a High Wind Warning. We'll probably see a less-urgent, less-severe Wind Advisory for the rest of the state. Additionally, we'll be on the lookout for advisories and warnings for coastal flooding, inland flooding, and winter weather. --Rough timeline: So far, I've labeled the timeline of the nor'easter as "late Sunday into Monday, and possibly Tuesday too". We can get a bit more specific now: the brunt of the storm will arrive Monday morning, with the heaviest rain and wind traversing the state through Monday afternoon. That's when the strongest winds, heaviest rain, and highest tides are expected. Exactly when the rain/wind will start on Sunday? Exactly when they will end on Tuesday? Still in flux. --It’s going to be very wet: Periods of heavy, driving rain are expected from Sunday to Tuesday. Models admittedly differ on precise rainfall totals, ranging from about 0.9" to 3.2". It's good news for New Jersey's moderate to severe drought situation. But flooding (river, flash, or coastal) could be a significant danger. --It’s going to be very windy: Very low pressure will drive strong east-northeast winds, sustained over 30 mph with potential gusts to 60 mph. That’s certainly enough to down tree branches, cause sporadic power outages, and make driving difficult (especially for high-profile vehicles such as trucks and buses). The strongest winds will occur along the Jersey Shore, producing storm surge and coastal flooding (see below). --Wintry potential: Oh, North Jersey. Your higher elevations and colder temperatures always pose such a fascinating conundrum in the wintertime. Thanks to a powerful area of high pressure over New England, cooler air may leak into far northern New Jersey during the peak of our impending storm. Cold enough to sustain a period of snow and/or freezing rain? Maybe. How much snow or freezing rain? Models have been all over the place, but I'm leaning toward "just a little bit" - on the order of a trace of ice, and an inch of snow. Such wintry impacts would be limited to the area north of I-78 and west of I-287. --Coastal concerns: Oh, the Jersey Shore. Your beautiful coastline and countless tidal waterways always pose such a precarious situation when fierce easterly winds begin to blow. So far, indications point to 3 to 4 foot surge up and down the coast. That's enough to cause minor to moderate coastal flooding - typical for a strong wintertime nor'easter. The most precarious high tide cycles will be early Monday morning, Monday midday, and early Tuesday morning. Why the uncertainty? A little shift in the predicted wind speed and/or exact direction could have a dramatic effect on the magnitude and location of the peak surge. 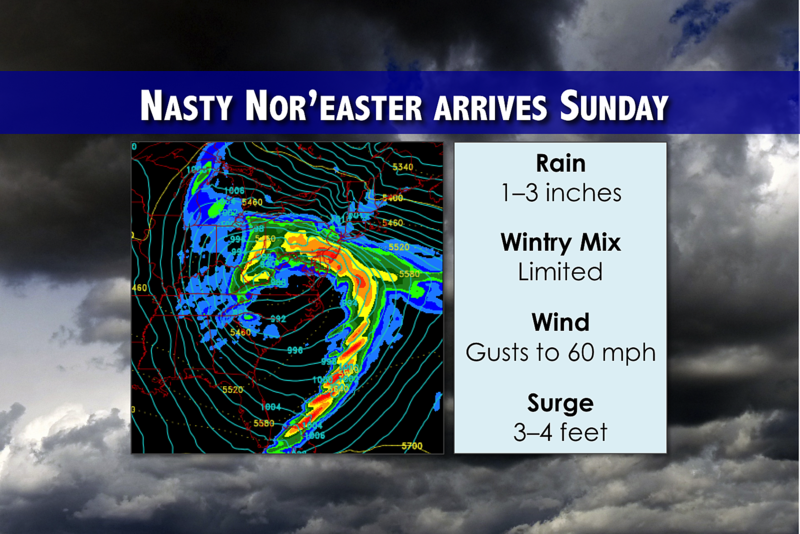 I think the best word for this nor'easter's impacts is indeed nasty. Yes, we're dodging a huge snowy bullet, thanks to the continuation of mild temperatures. However, no matter which combination of weather factors you personally experience (rain, wind, freezing rain, snow, coastal flooding, high surf), it's going to be quite unpleasant. And maybe dangerous. Our weather team will continue working around the clock - before, during, and after the storm - to communicate the latest information to you. Unless something changes dramatically, the next weather blog will be posted Sunday morning.